The Band was originally formed in 1971 as the Coalville Band, with one of the founder members still playing in the band today, Dave Wright. With escalating costs it was necessary to find sponsorship and in 1977 a local company, Ibstock Building Products Ltd. came forward and decided to give the band the sponsorship it needed, the band became known as the Ibstock Building Products Band. In March 2000 the company took the decision to change its name to Ibstock Brick Ltd. And once again that meant a change of name for the band, giving it its name today, The Ibstock Brick Brass Band. The band travels all over the United Kingdom to play in concerts and contests and have made two trips to France to give concerts. Fortunes in contest seasons have been varied, but over the years a large number of prizes have been won. Highlights have included playing in the National Finals of Great Britain at the Royal Albert Hall and taking part in the Grand Shield held at the world famous Belle Vue. 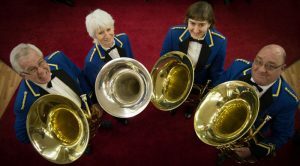 In 2000 the band won the 2nd Section Midlands Regional Championships giving them the chance once again to take part in the National Finals of Great Britain at the Royal Albert Hall in London where in the millennium year, the band gained third prize. 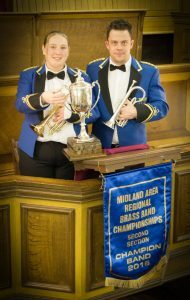 They recently gained 1st prize in the 2nd section of Midlands Regional Championships giving them the chance once again to take part in the National Finals of Great Britain at the centaur at Cheltenham Racecourse.